Abstract: Food blogs are increasingly gaining importance not only in the virtual sphere but offline as well. This paper looks at the creation of identity and process of interaction in two German food blogs. Drawing on current theories of Internet and community space this paper will interpret what is occurring in this online group. While the food blogosphere was born in the realm of new media (the Internet) it must by its nature rely on the offline food world, as well as traditional media spheres such as print and television. The German food blogging community acts as an example to observe how bloggers represent themselves and interact amongst each other in this relatively new medium. Media and food are both constantly evolving, and thus an article of this kind is restricted by the paper on which it is written. Therefore, this project is not intended as a final conclusion on the topic, but rather as an introduction to the possibility for exploration and expression. Food blogs have become a wildly popular platform for individuals to write about their recipes, restaurant meals, opinions, and food experiences in a public forum. Some argue facetiously that everyone with a fork and an Internet connection has a weblog of his or her own. While this is not accurate, it may not seem too far-fetched. Every major newspaper with a food section now has at least one food blog, if not several, on their websites. Writers who began by posting their personal thoughts and recipes regularly on their blogs now have major book deals1 and jobs working for the Food Network.2 While food constitutes only a small portion of the topics written about in the blogosphere, this still accounts for thousands of blogs on food in many different languages. This paper will focus on how two German food bloggers portray their identity through their blogs, and how their interactions with their readers and other bloggers shape a sense of community unique to the medium.3 A unique convergence is occurring in food blogging: while the food blogosphere was born in the realm of new media (the Internet) it must by nature of its subject rely on the offline food world, as well as traditional media spheres such as print and television. This mixing of media is what Henry Jenkins calls convergence culture: the blending of media and users who are willing to follow it.4 It is evidenced all over the food blogosphere: blogger Adam Roberts' erstwhile television deal with Food Network as its host of the weekly food celebrity web show "FN Dish;" and pastry-chef-turned-expat-blogger-in-Paris David Lebovitz's several published cookbooks. While English-language blogs, like Roberts' "Amateur Gourmet" and Lebovitz's eponymous blog, are highly popular internationally, they are only one portion of the food blogosphere that exists. Just as Hollywood has its celebrities along with the countless actors who are in L.A. trying to make a break, or simply to follow a passion, food blogs have their own set of stars and lesser-known individuals, all engaging in the media for their own reasons. This paper will focus on a specific subset of blogs, namely two blogs out of Munich including the internationally popular blog, "Delicious:Days," written in English by Nichole ("Nicky") Stich, as well as the German-language blog "Cucina Casalinga" by Nathalie,5 which is more locally/nationally focused. There are countless variations of food blogs, which makes choosing a set for study challenging. Susan Herring has created a methodology for what she calls Computer-Mediated Discourse Analysis,6 in which she discusses how to choose a corpus of online data. She suggests three different methods, including choosing random, motivated, or convenience samples.7 In this case, a random sample was not feasible, as it would have required the virtually impossible task of collecting every German blog on the Internet from which to randomly choose.8 Thus, the choice was made for these two blogs out of a combination of motivation and convenience: both of these blogs were chosen because they are by women writers out of Munich, which narrows down geographical and gender variations, but also because they provide examples representative of the food blogosphere at large, as well as social norms and trends in German society offline. These were also samples of convenience, as the author was already following several German blogs before this project was started. The similarities between these blogs raises questions about the significance of two women blogging about food out of Munich. Women bloggers, while they are less popular than their male counterparts, can claim authorship of at least half of blogs on the Internet and are more likely to be blogging about creative pursuits.9 Furthermore, Munich is known for its flourishing tourism and food industries. While every region in Germany prides itself on its distinctive food cultures, it is arguable that Munich is even more aware of its cuisine, due at least in part to the foreigners who come and enjoy the food. Both bloggers in question write about shopping in several of the city's specialty food shops and local fresh produce markets, as well as their favorite regional Bavarian foods. Stich and Nathalie are bloggers who cook much of their own food and post about it. This is a general trend in food blogging, though these two particular blogs are also scattered with trips around Germany and abroad. When traveling, and also sometimes while at home, they will post about the foods they ate in restaurants. However, both of these bloggers write mostly about their own personal cooking experiences. These two blogs are examples of convergence culture: the bloggers take personal, family, and national food cultures that have been passed through traditional methods of communication and post them on the Internet, creating a community that is entirely dependent on both virtual experiences online and physical experiences in the kitchen. This paper will look at the online community of these two German food blogs, drawing on current theories of Internet and community space, the evolution of the blog and blogging communities, and other studies of "virtual ethnography" to interpret how these bloggers portray their identities through their blogs, food, and what kind of interactions occur as a result of engaging in the medium. While this work by no means can encompass all aspects of this new and constantly evolving topic, it will act as a stepping stone for further analysis, providing a window onto possible themes and tropes that appear in many food-related blogs. "There are only a few things you need to know about weblogs." This quaint introduction by Rebecca Blood to the edited anthology We've Got Blog was written in 2002, three years after the first weblogs, or blogs, took off. This book of essays on the topic was, at the time, revolutionary: one of the first collections of essays to look at blogs from a self-reflective angle, but also using the "old-fashioned" media, that of print books. All of the essays had been originally published on the Internet, but it is fascinating to look at how they come together in print. What becomes evident right away when reading through this collection is that blogs have changed dramatically in the six years since this book was published. Another contributor, Derek Powazek, acknowledges a change just in the three years since blogs first evolved, arguing that originally, blogs were sites with links to other sites: "each was a mixture in unique proportions of links, commentary, and personal thoughts and essays. "10 Now, blogs are multimodal, and include videos, Twitter feeds, and photographs to expand the way content is presented to the reader. An initial core group of 23 blogs developed in the end of 1998/beginning of 1999, according to some sites maintained by individuals who listed all the blogs they were aware of. In August of that first year, Pyra Labs, a small dot-com company out of San Francisco, launched Blogger.11 Along with LiveJournal, a blog hosting platform started the same year with an open-source codebase, Blogger made a big impact. Suddenly, instead of requiring significant knowledge in web design, HTML, and other coding languages used to create and maintain websites, bloggers only needed to know how to write the equivalent of an email. Blogger created templates, organized content, archived posts, and hosted the weblog. Users simply filled out a couple fields: a title for the post, and the content of their desire. And so, the blogosphere was born. Like in other topics, food bloggers connect via comment sections in blogs, post about each others' sites, list other blogs on their blogrolls, and engage in group blogging memes.20 The complex web of social interaction in the blogosphere is compounded by millions of readers in addition to the thousands of bloggers and thus makes a statement of its size nearly impossible. Nevertheless, the German food blog community is much smaller than its English-speaking counterpart. In 2010, Topblogs.de ranked 293 food bloggers who submitted their blogs for ranking. However, while all of these are in German, it does not appear that German speakers writing in English are represented here.21 It is difficult to come up with a definition of a "German food blog," not to mention figures on how many there are. German language blogs are hosted by bloggers of different nationalities, not only from German-speaking countries. In addition, some German bloggers use English as their main language. Still others write in both languages. Furthermore, a "food blog" can be written by anyone from someone who collects cookbooks to someone who reviews restaurants, to someone who writes about their baking experiences. For the purposes of this paper, a German food blog will be defined as a blog with food in any form as its main focus written by any person living in Germany or a German-speaking country (writing either in English or German) or anyone worldwide writing in the German language. Henry Jenkins uses "convergence culture" to define content blending across different media platforms and an audience willing to follow this flow of information, which he argues "[…] occurs within the brains of individual consumers and through their social interactions with others. "24 Blogs are a prime example of convergence culture, because they take content from other websites, as well as from other media such as film, print journalism, books, etc, and post them on a website for other people to comment and react upon. Just as content can travel from print to digital, the reverse occurs as well with many bloggers being profiled in magazines and getting book and television deals. Content in these instances is evolving from one media platform to another and, in the process, is being filtered and interpreted by countless users. This is the act of convergence culture: content shifting from one kind of media to another, and arguably the act of forming an online community space. Online communities are formed around drawing connections, and one can do so by taking advantage of many different forms of media: books, websites, Twitter, and blogs all are different platforms with which people can engage in a topic, and the discussion frequently crosses over from one to the other. Herring has proposed both a framework for Computer-Mediated Discourse Analysis (CMDA), as well as for Web Content Analysis (WebCA) aimed specifically at helping to analyze blogs.26 She argues that traditional modes of analysis, in which language-specific coding is the main focus, lacks the comprehensiveness required in an all-inclusive study of blogs.27 She instead suggests an expanded paradigm, which includes the use of image, theme, feature, link, and exchange analyses in addition to language (discourse) analysis. For examples of these paradigms in blogs, see Table 1 below. Theme Tags on posts identifying them as containing information on subjects such as "dessert" or "poultry"
Examples for Herring's Paradigms for Web Content Analysis (WebCA). Adapted from Herring "Web Content Analysis." Although comprehensive, Herring's analyses are not exclusive of other ways to analyze how bloggers are portraying themselves on the Internet and interacting amongst each other. Herring builds into her framework the ability for expansion by including ellipses for extra categories of analysis that signify future developments in WebCA. She argues that in any existing system, blog researchers have had to adapt methodologies to fit their own needs.28 WebCA is no exception, and in this paper Herring's paradigm will be applied and expanded to include "food analysis," as the topic of food plays a defining role in the medium through how it portrays the unique character and community of a food blog. Herring's theory will be used as a reference in tandem with Goffman's concepts to analyze interaction and identity in the two blogs in question. Blogging activity can also be framed using Erving Goffman's concepts to describe an individual's portrayal of self in a society: the self as social ritual, strategic gamesmanship, and dramatic performance.29 These three metaphors can be studied in blogs by looking at all the components Herring discusses. In blogs, these components express themselves in the form of, among other things, comments sections, posts, recipes, and their photographs. The metaphor of social ritual is an engagement in "face-work," that is the process of performing socially recognized and approved moral acts to improve one's face (or reputation) in society.30 The comments section of blogs is where much of the blogging rituals are negotiated—and they are being negotiated because the medium is still relatively new, and social norms are being developed daily. For example, in one post on Stich's blog "Delicious:Days," she described a weekend at an Italian villa, which she disclosed as having been paid for by the proprietors. One commenter questioned the ethics of this post-vacation update, to which Stich promptly and directly responded that when "free-bees" are offered, there is no obligation on the blogger's part to return any favor in posting, and if they do post it is on their own terms.31 Her post and response also alluded to several other bloggers joining her in the weekend, which supported her claim to legitimacy.32 In Goffman's terms, this is known as "saving face": in her response, Stich affirmed her moral face in the blogging group by defending herself against accusations of abusing her blog by becoming free advertising for companies. Roberts is suggesting that bloggers put themselves out into the blogosphere and make themselves vulnerable with their posts, and sometimes they are validated through readers' comments, and sometimes they are not. However, each post is a strategically written process with the readership's experiences in mind in order to draw the maximum response. The most direct way in which these bloggers perform is through their food. As anthropologist Mary Douglas discusses, groups and individuals form strong identities around the foods they eat. Groups form taboos, or "off-limits" foods in order to define (and exclude) participation in the community.36 Food blogs are no exception: bloggers perform their identities through the recipes they choose to cook, photograph, and share with their readers. Together, Herring and Goffman's theories provide a foundation from which to begin a discussion of the formulation of an identity and community in food blogs. Some critics might be skeptical that an online identity is in fact a valid identity that can be researched, given the anonymity and ease with which individuals can lie about themselves online. However, Goffman would argue that claims of self are a result of many different representations in, and influences of, society, and that this creates a dualistic definition of self: the self-as-performer and the self-as-character, most easily described as the person who wears the mask, and the mask itself.37 We only gain a sense of reality through our actions, but they are always framed by the way society perceives us.38 Thus, online portrayals of self are arguably just as valid as offline portrayals, simply in a different context of social norms and rules. Questions of the legitimacy and efficacy of Internet communities extend further into the concept of virtual social interaction. Ethnographer Christine Hine argues that many people believe the Internet encourages previously existing social interactions; that it promotes the continuation of a conversation from the offline world in the virtual world. However, she points out that it is in fact becoming increasingly clear that the Internet is causing social discourse.39 A great example of this is the blogosphere in which conversations occur within the Internet that would not occur outside of it. Food bloggers who post recipes or restaurant reviews might cook and eat the foods they blog about even if they did not blog, but the virtual conversations, friendships, and the subsequent recipes they cook off of other people's blogs would not occur otherwise. Furthermore, the Internet sparks these conversations because of its ability to overcome obstacles not easily ignored offline. Geographic distances (though not language differences) are far less important online, allowing users world-wide to engage in conversation. In addition, users can easily find people with common interests through online profiles (unlike in offline settings, where people do not tend to list their likes, dislikes, and hobbies for the world to see). These factors, in addition to the myriad opportunities for engagement in blogs, (including but not limited to blogrolls, comments, and links) invite a community to evolve in a way that is unique to the medium. Analyzing Food Blogs: "Delicious:Days" and "Cucina Casalinga"
As a member of the broader food blogging community myself, I acknowledge that my place in this community is both as a member and as a researcher. This provides several positive attributes to this study, including the ability to look at the community as an insider, but with the knowledge and privilege of an academic. Hine argues that an Internet ethnography allows the researcher to observe in ways face-to-face ethnographers cannot, but she points out that at the same time this relinquishes the authority that a researcher's interaction with a community can acquire.40 However, I maintain that in order to interact with a culture one must use the culture's means of communication. Bloggers and their audiences communicate primarily online, and when offline communication occurs, it usually enriches instead of causes the online experience. Therefore, in the process of analyzing the blogging community, one must use online interaction as a primary source, and offline forms of communication—when available—to supplement, not to claim authority. As mentioned, this paper looks at two blogs: "Delicious:Days" and "Cucina Casalinga." There are many blogs written in German from many different geographic locations. The nature of the blogosphere (and the Internet itself) is that geographic area does not, on the surface, appear to matter. However, a blog analysis shows that these two blogs do portray their own regional influences on their blogs. 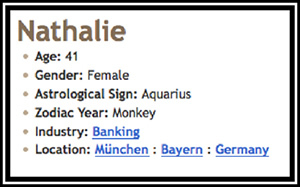 Both bloggers write out of the same city in Germany and both are employed in high-paying industries (Stich's day job evolves around internet web design and Nathalie is employed in the banking industry). Despite these similarities, their blogs have vastly different feels to them. "delicious:days is our playground and will let you take a peek into our steamy kitchen, mouthwatering recipes and delightful nibbles included, all served on a tasty plate. Can you say yum?" On the far left she has an icon advertising one of her blog's awards: in February 2009 she was listed fourth in UK's Time's Online "50 of the world's best food blogs." In the center of her banner she regularly updates a food news feed, and on the far right she rotates advertising her new eponymously titled cookbook, as well as the recently-launched beta version of her recipe organizing software "RecipeShelf" (complete with iPhone application). Using Herring's WebCA paradigm and Goffman's metaphors for social engagement, these blogs can be examined in order to discuss how bloggers Stich and Nathalie portray themselves and interact with others through the medium of the blog. Specific components of the blog (Herring's images, themes, features, links, language use, and exchanges) support the two research questions, which provide a contextual framework for Herring's analysis methodology. Goffman's metaphors for social participation are used to supplement this analysis. When it is next to impossible to verify someone's identity, as is usually the case on the Internet, it is necessary to regard the Internet as its own culture and people's identities on it as their authentic Internet characters—even if they may differ from people's identities offline. This does not mean that identities should be assumed, but more that identity formation should be looked at as an indicator of who the author is, and (perhaps more importantly) who she wants to be seen as. Identity is created in almost every component of the blog. For food blogs, perhaps the most important form of identity creation is the foods themselves the bloggers choose to write about. This will be discussed in more detail, but foodways play a large role in a person's identity in a larger group. Foodways include the entire cultural, economic, and political food system: what we eat, how, when, and with whom are all ways that a person can claim allegiance to, or distance from, a group of people (be it a group of blogs or a nation). Identifying with a particular group's food is empowering, and simultaneously limiting: it dictates our exposure to various types of foods. However, blogs offer a safe exposure to food to a large and diverse readership. The food Nathalie eats abroad acts as a statement of Nathalie's identity, and extends into her home kitchen as well. She cooks with high-end ingredients, emphasizing the fresh and homemade. She has labeled some of her posts with the category "Dinner for One," in which she demonstrates that although she is cooking for herself, she makes herself meals such as veal cutlet with brussels sprouts, and sausage with potato salad. Even when no one is physically joining her to eat, her readers are virtually looking over her shoulder at her food choices. This is an interesting phenomenon, and represents how the online identity that is shaped by offline experiences in turn influences the offline identity as well. An analysis of a blog's features also displays its author's identity. From the title, which is the first glimpse a reader has of the blogger, to the layout, which shows what the blogger finds important to put where, the way a blog looks and reads is arguably just as important as its content. The title "Delicious:Days" invokes a sense of a rich cache of food, but also accompanies Stich and Seidel's stylish sense of design and mouth-watering photographs. "Cucina Casalinga" references the Italian influences in Nathalie's food, and her professed love of vacation south of the Alps. Stich's "Food News" section on "Delicious:Days"
Stich's blog presents information in a multimodal format: her food news feed (see Fig. 3) at the top of her site is updated more regularly than her posts, and this gives her readers a reason to return to her site while she prepares her next update. Stich also includes lists on the right-hand side of her website, next to her posting section, which include her favorite cookbooks, music, and literature (each linked to Amazon where readers can purchase copies). Her tastes range from the strange and slightly disturbing singer-songwriter Devendra Banhart to "Plates and Dishes," a book that chronicles the author Stephan Schacher's visits to roadside diners around the United States and Canada. Stich's posts are similarly eclectic. Updates have included recipes for a variation on Marcella Hazan's arance fruit dessert,48 homemade coffee liqueur,49 and a cold remedy she named Thylehogichi after its ingredients (thyme, lemon, honey, ginger, and chili).50 These all reflect her welcome statement in her banner, that she is giving her readers a glimpse into her kitchen, but she is also sharing her eye for design. This statement complements Goffman's metaphor that the self that is expressed in society, or here online, is the mask that one wears, and the self that is the internal, or here offline, personality is the performer. Readers always want to know more about the person behind the blog, whether she likes the same music or art as they do, or what she does besides cooking in her spare time. The act of writing a food blog is very much a constant negotiation of how much the online identity reflects the offline identity. A blogger creates her identity not only through the foods she chooses to write about, but the other information about herself that ends up in her posts. Very few bloggers post just a recipe; most add in a short introduction of why they cooked the food, or (at least) edits they have made to the recipe. Identifying the virtual self is not just about how a blogger writes and presents herself online. In choosing to cook, consume, and write about food, these bloggers are performing an identity on multiple levels. Not only is identity performed in the process of photographing and writing a post, but it is performed in the kitchen and at the dinner table as well. The very act of eating is performing an identity; for example, two different associations are made in choosing to eat chocolate ice cream or a mango. Both are luxuries, but while the former suggests a childish indulgence, the latter suggests a sophisticated snack. Susan Kalcik ties performance to food choice by pointing out that people choose the foods they eat because of who they are, but also because of who they wish to be.54 A person eating blood sausage defines herself in different cultures differently—in many parts of Germany, someone eating blood sausage is identified as having a developed palate and being part of the knowledgeable who can value the taste and texture of what is considered there to be a delicacy. However, in the United States the consumption of blood sausage was rejected from the German-American community, because other cultures considered it a taboo food.55 Thus, in choosing to post about the recipes they cook, the foods they enjoy, and the stores they shop in, food bloggers are constantly negotiating not only their own culture's foodways, but their readership's as well. They are engaging in a performance, a sculpting of an identity online that is defined by the foods that end up on their websites. While one might think then that the process of negotiating so many cultures would create a very bland blogging community of watered-down cultural foods that are agreeable to the masses, this is far from the case. In her article on food as an expression of national identity, Anne Murcott takes the stance that nations are negotiated and imagined by a group, not entities separate from a group. Furthermore, she argues that print media is a form in which this national identity is discussed, transformed, transported, and deciphered.56 It is logical here to argue that the Internet plays the same role as print media. Murcott continues by asserting that food as a means of communication is another way of transporting the concept of a national identity. Thus, blogs are a platform on which national foodways are expressed and discussed. Moreover, they are a space where people can safely, without leaving their living rooms, cross over their own traditional cultural boundaries and engage with other foodways. In a restaurant, people have to consume the food they encounter (for a discussion of the aversions to consuming foods from other cultures that challenge one's own, see Douglas, Murcott, and Parasecoli),57 whereas in a blog, readers can safely be exposed to new foodways without having to challenge their own personal eating culture. Blogs here play a role similar to a magazine or book, but the potential readership is much larger than that of traditional print media. Blogger Profile for Nathalie of "Cucina Casalinga"
Stich's blog "Delicious:Days" offers a foil to Nathalie's "about" section. Hers is accessible on the top left corner of her homepage and takes the reader to a section with the same layout as the rest of the blog. Scrolling down there are three paragraphs in which she introduces herself and her partner, Seidel (who manages the technical aspects of the blog), which are followed by black-and-white pictures of the two. Below this is a series of the dozens of mentions in print media, as well as awards the blog has received. Lastly, there is a series of questions and answers about the technical aspects of the blog, such as what camera they use and how to advertise on the blog. While Stich's "about" section is much more descriptive than Nathalie's, it ends on a more commercial note: blog advertising. Stich and Seidel run Delicous:Days as a brand, and they are clearly making money out of their "passion," as Stich infers on her blog. In addition to her use of advertisements and awards, Nicky has made and completed a book deal, the process of which she blogged about,60 which is being published by one of Germany's largest cookbook publishers, Gräfe und Unzer. Although it is a contested subject and some bloggers refuse to advertise on their sites, making money off of blog ads is not necessarily a bad thing; in fact, according to Technorati, the majority of blogs do. European bloggers who advertise make an average of 9,040 USD a year, but most blogs make less than 200 USD.61 Stich and Seidel sell ad space on their blog for 790 USD a month.62 Calculating two ad spaces available at a time on the website (which is the current status), they are grossing about 20,000 USD a year. From a financial viewpoint, "Delicious:Days" is a very successful venture, and this does not include revenue from their cookbook, nor from their new recipe software they are soon to debut, that have come out of the blog. "Delicious:Days" is an example of a blog written more like a branded column of the kind that other English-language blogs such as Adam Roberts' and Clotilde Dusoulier's engage in, whereas Nathalie's blogging style represents one that is more indicative of the diary-writer type. She does not post any advertising, and as such it appears that she makes no money off of her blog. As can be seen in the next section, Nathalie is focusing her blogging on the interactive, hobby aspects of the medium. The differences between these two blogs can also be seen upon looking more closely at the images these bloggers use, and their subsequent posting themes. When Nicky posts on her blog, she seems to be focused on how it will look on her blog, how it fits together with what she's posted before, and what she'll be posting about next. While Nathalie pays attention to this as well, she mostly just posts what she is having for dinner, or what she decided to try out that afternoon. There are positive aspects to both of these approaches: while the former offers a polished view of the modern German cuisine, the latter shows what is being cooked on a daily basis in the middle class German (or more specifically Bavarian) home. Much of Stich's posts are written around her incredible photography. The photos of her food set the theme for her writing: a post on roasted bell pepper and chorizo risotto starts with a photo of five impeccable, colorful bell peppers atop a stainless steel workbench (see Fig. 5) and ends with a bowl of risotto that is as nice as a picture of risotto can be.63 Her post describes how she stumbled upon an easy method for peeling the peppers and how to cook her recipe, with step-by-step pictures along the way. While her posts do not have a thematic trend necessarily—her risotto is followed by squid-ink-dyed grissini—it seems that the colors of her blog and her posts are just as important as the content. This makes for a very stylish, polished blog; her attention to detail in content and design is paramount. From this brief analysis, one can conclude that Nathalie performs herself through her blog by giving her readers a sense of her offline self—in this case not her internal (unmasked) self, but her offline performed self. One could thus argue that there is the internal self, the performed self, and the digital self. This tiered reflection of identity is seen also in Stich's blog; however, she focuses much more on the digital self as a unique identity, rather than the digital self as a reflection of the performed or internal self. This is not to say "Delicious:Days" does not reflect Stich's offline personality, but she shapes and crafts it to reflect perhaps an idealized, designed self online. This difference in how bloggers navigate the performance of self, especially in reference to recipe choices and advertising, does not seem to create too much tension in the general blogosphere. Each blogger tends to understand that her blog identity is unique, and that there are countless ways to blog. Both blogs use different features of the medium to shape their virtual identity for the reader, and give glimpses of their offline identities as well. The second research question is how these two bloggers interact with other bloggers and readers. Herring's six components again can be used in this case, most specifically looking at links, exchanges, and language use. Specifically, interaction can be measured by looking at blogrolls, comments, and blogging memes. Because of the complexity of blogging, and the inability to know exactly who reads the blog and therefore who is in the blogging community, it is hard to pin down interaction. However, by looking at blogrolls, how and under what circumstances bloggers link to each other, and the kinds of blog memes they participate in, it is possible to come up with general conclusions. To begin with, one easy way to know what interests a blogger is by looking at her blogroll. The blogroll is a list of blogs that the blogger finds interesting and posts somewhere on her site. In addition to being able to hop and jump from blog to blog all afternoon, it is a great way to study the intricate web of interaction. Nathalie lists seventy-seven food blogs on her site. Separately, she lists seven blogs on other topics. Of the food blogs listed there are six written in Italian, three in French, and one in English. "Delicious:Days" is not included in her blogroll (neither is "Cucina Casalinga" listed on Stich's blog). Overall, it can be deduced from Nathalie's blog that her priority in creating connections with people is to interact with people who are interested in similar topics as she is. Most of the blogs she links to use blog hosts like Blogger, TypePad, or WordPress and thus have similar aesthetics to her own blog. Many of the bloggers she links to also comment on her posts and vice versa (as will be discussed later on). For Stich, her blogroll is organic, and reflects her tastes and interests, not a desire to connect with other bloggers. "Delicious:Days" is writing for an audience, and expressing her own identity through her interactions with others. The comment sections for both of these blogs are quite active, but in different ways. Over ten consecutive posts, 32 people posted comments (some multiple times) on "Cucina Casalinga." Nathalie's posts received an average of 5.5 comments, almost a third of those who commented posted more than once, and 20% of commenting readers (6 people) posted four or more times. In comparison, 162 individuals left comments on ten consecutive posts on "Delicious:Days". Each post received on average 19.6 comments, with 16% returning commenters, and only 0.02% (3 readers) posting four or more times. While initially one would conclude that because Stich receives, on average, almost four times as many comments as Nathalie, that her community is more significant, but this is not necessarily true. Here again, Herring provides a useful framework from which to approach looking at these comments in terms of community: she argues that an online community includes measurable participation, a shared history, solidarity, criticism and conflict, a group's self-awareness, and a set of roles and hierarchy.69 Both comment sections of "Cucina Casalinga" and "Delicious:Days" exhibit all of these behaviors, but they build into two different kinds of online communities. Nathalie's commenters share a tangible history through reading and commenting on her blog, but also because Nathalie does the same on her readers' blogs. Those who comment most frequently on Nathalie's blogs are bloggers who Nathalie reads regularly herself, and who she links to on her blogroll (and vice versa). This shows solidarity on the part of both people involved (reader and blogger), in addition to a set of roles and norms. When Nathalie comments in her own comment section, she usually responds to all who have commented70 and has the final say on the topic. Nathalie's discussion of the element of voyeurism involved in reading and writing blogs is an example of the group's self-awareness: an open discussion and agreement of why participants in the group blog and read blogs. In Stich's blog, participation can be measured by the number of comments posted, but the shared history is more often one in which a commenter who has been a long-time reader will post for the first time. Stich's posts, not the individual interactions with or amongst her readers, become the shared historical foundation. Conflicts occur, such as the reader who questioned the ethics of Stich's weekend paid getaway, but overall solidarity is displayed through comments like "kaltmamsell's" in response to Stich's cold-remedy: "Please consider it a iron proof [sic] of the trust I have in you that I will actually try this. Appetizing is not exactly what it sounds. But if you say so. Erm—thanks. "71 Through these same interactions, roles and hierarchies are established: Stich not only is an authority figure as the blogger, but her readers' comments displaying trust, or thanking her for a new recipe, solidify her status as a knowledgeable and helpful person. Just as Nathalie has the final say in her blog, so does Stich when she responds to comments (she does not respond to each comment, but does answer questions). This seems like a normal segue today, but in the 2004 food blog world it was quite revolutionary: an Italian's soup recipe was posted side-by-side with a German's and they could be tried out and compared simultaneously. Not only was this a new form of expression, but it was popular precisely because it exploited what already made blogging popular: it was yet another way to use the medium to give voice to an individual, and to hear other individuals' voices in return. Bloggers jumped at the chance, and the inaugural event included thirteen participants blogging about soup. By the time IMBB was phased out, the last event on cooking with tea had over ninety participants. Another event that still continues today is Sugar High Friday, which began later in 2004 but is one of the longest-running food blog events on the web. Some bloggers who typically blog in other languages (including "Cucina Casalinga" among other German bloggers) have participated in these events by blogging in English, while others write their additions in their own languages. However, blog events by no means have to be held in English, and German food bloggers have created countless fascinating blog events. Today, IMBB has turned into a website of its own,75 run by other food bloggers than the original Alberto, and tracks blog memes all over the Internet. All of these blog events serve to encourage the virtual community, precisely as bloggers intended them to. Not only do participants get to see what others are cooking, but it is a sure-fire way to get hits to their blogs, thereby increasing their own involvement in and exposure to the community. Whether or not a blogger wants to use the blog as a medium for profit, almost all bloggers want to be seen and read regularly. To become involved with blogging events is one way of being a part of the conversation. Furthermore, blog events represent a way in which bloggers participate in Goffman's theory that individuals perform an identity in social settings. Which blog event, how often, and on what topic bloggers participate in are all ways in which bloggers choose to perform certain roles and rituals in this virtual social setting. One very interesting blog event that occurred four times is "Deutsche schicken sich gegenseitig Fresspackete" (freely translated by Rosa from the English: German Blogging By Post),79 which came out of a European-wide event called Euro Blogging By Post.80 This event steps out of the virtual realm and into the bloggers' physical kitchens: bloggers sign up for the meme, the host creates an elaborate scheme "Secret Santa" style, and bloggers have a certain amount of time to put together and send packages (preferably reflecting their gastronomic region of Germany) by regular postal service to their assigned blogger. In return, they receive a package from a different blogger, which they photograph and blog about, posting their reactions and, in some cases, recipes in which they cooked with received ingredients. This kind of interaction is Jenkins' "convergence culture" at its core: using virtual and offline modes of communication to create a community of bloggers that transcends one singular medium. While in some ways, this offline communication can be seen as establishing the blogging community (it is "finally" becoming something "real"), it is in fact just another way of taking advantage of all the forms of communication available today. Subsequently bloggers have used other media such as Twitter,81 mobile phone cameras,82 Facebook,83 and so forth to communicate in multiple ways with each other and the reading audience. Whatever the medium used to communicate, the food blogosphere is vast and intricate, and interaction within it deserves a much closer look. Even within the much smaller German food blogosphere, it is the many ways in which members can interact that makes the community viable, not to mention vibrant. Although the history of food blogs is very short, they have evolved into a valid medium from which to study how an individual creates an identity and interacts with others through their food and the Internet. "Delicious:Days" and "Cucina Casalinga" are two different examples of how food bloggers shape their identities within a virtual community. Using Herring's Web Content Analysis framework, as well as Goffman's social theories on the performance of self, one can see that these bloggers are shaping their identities and involving themselves in communities online in ways that they otherwise could not have done offline. In "Delicious:Days", Stich represents a digital self that she has shaped from her offline self to portray an idealized world with her partner in her Munich/Haidhausen apartment. Stich's posts and her responses to comments are in the manner of a knowledgeable acquaintance, not as much someone who is writing for peers. A traditional reference for this would be someone who is a newspaper columnist: Stich is a person readers can identify with, but also someone who has perfected the lifestyle and community she represents on her blog. Nathalie's "Cucina Casalinga" is an example of the diary-writer blog. She posts daily about her meals, wines, and travels, and, as a consequence, Nathalie shares much of her offline self. Her focus online is to connect with peers who have similar interests and hobbies as she does, and she seeks out Internet conversations with others. Her participation in blog events, and her back-and-forth comments with other bloggers suggest that she is involving herself fully in all of the communicative aspects food blogging has to offer. Both of these bloggers work hard to shape their identities and their involvement with their readers. It cannot be argued that one expression is superior to the other, nor should it be. These are simply two different ways in which to engage with the same medium. These two blogs in themselves provide a rich treasure chest to study how people can shape and share their identities online in different ways through writing, photography, and design. Alberto. Proposal for a Blog Cooking Day. Il Forno. 26 January 2004. <http://ilforno.typepad.com/il_forno/2004/01/proposal_for_a_.html> (13 October 2009). Barrow, Andrew and Ronald. Is My Blog Burning? <http://www.ismyblogburning.com/> (13 October, 2009). Bauer, Elise. Simply Recipes. 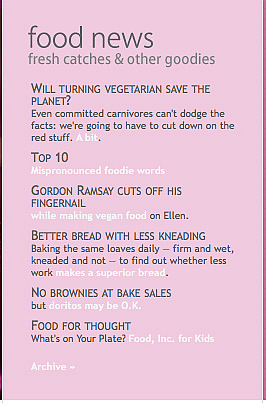 <http://www.elise.com/recipes/> (13 October 2009). Branaman, Ann. 1997. Goffman's Social Theory. In The Goffman Reader. Edited by Charles Lemert and Ann Branaman. Malden, MA Blackwell Publishing. Crystal, David. 2006. Language and the Internet. Cambridge: Cambridge University Press. Denny, Kalyn. Kalyn's Kitchen. <http://kalynskitchen.blogspot.com/> (13 October 2009). Douglas, Mary.1984. Pollution. In Food in the Social Order. Edited by Mary Douglas. Russel Sage Foundation. Dusoulier, Clotilde. Chocolate and Zucchini. <http://www.chocolateandzucchini.com> (13 October 2009). _____. Clotilde's Moblog. <http://chocolateandzucchini.com/moblog/> (13 October 2009). Foodbuzz. About Us. Foodbuzz.com. <http://www.foodbuzz.com/pages/about> (13 October 2009). Gruber, Helmut. 2008. Analyzing Communication in the New Media. In Qualitative Discourse Analysis in the Social Sciences. Edited by Ruth Wodak and Michal Krzyzanowski. New York: Palgrave Macmillan. Hine, Christine. 2000. Virtual Ethnography. London ; Thousand Oaks, Calif.: SAGE. Herring, Susan C. 2004. Computer-Mediated Discourse Analysis: An Approach to Researching Online Behavior. In Designing for Virtual Communities in the Service of Learning. Edited by Sasha A. Barab, Rob Kling, and James H. Gray. Cambridge: Cambridge University Press. _____. 2010. Web Content Analysis: Expanding the Paradigm. In International Handbook of Internet Research edited by Jeremey Hunsinger, Lisbeth Klastrup, and Matthew Allen. Springer, forthcoming 2010, Preprint in PDF: <http://ella.slis.indiana.edu/~herring/webca.2008.pdf> (20 February 2010). Jenkins, Henry. 2006. Convergence Culture : Where Old and New Media Collide. New York: New York University Press. Kalcik, Susan. 1984. Ethnic Foodways in America: Symbol and the Performance of Identity. In Ethnic and Regional Foodways in the United States : The Performance of Group Identity. Edited by Linda Keller Brown and Kay Mussell. Knoxville: University of Tennessee Press. Kellogg, Alanna. Kitchen Parade. (13 October 2009). Long, Lucy M. 2003. Culinary Tourism: A Folkloristic Perspective on Eating and Otherness. In Culinary Tourism. Edited by Lucy M. Long. University of Kentucky Press. Murcott, Anne. 1996. Food as an Expression of National Identity. In The Future of the Nation State: Essays on Cultural Pluralism and Political Integration. Edited by Sverker Gustavsson and Leif Lewin. London, UK: Routledge: 63. Nathalie. Cucina Casalinga. 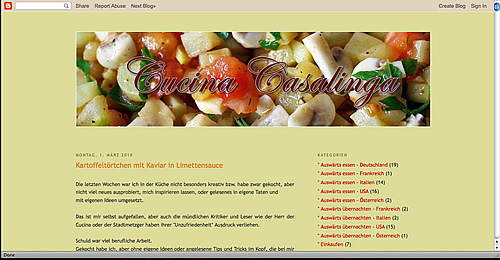 <http://cucina-casalinga.blogspot.com/> (27 February 2010). Parasecoli, Fabio. 2008. Bite Me: Food in Popular Culture. Oxford, UK: Berg. Pederson, Sarah and Caroline Macafee. 2007.Gender Differences in British Blogging. Journal of Computer-Mediated Communication 12 (2007): 1472-1492. Roberts, Adam. The Amateur Gourmet. <http://www.amateurgourmet.com> (13 October 2009). Rodzvilla, John (ed.). 2002. We've Got Blog : How Weblogs Are Changing Our Culture. Cambridge, MA: Perseus Pub. Rosa. GBBP – DssgFP 1. Neuhausener Nudelsuppe. 28 March 2006. <http://www.schnuppensuppe.de/blog/index.php?itemid=230> (13 October 2009). Stich, Nichole. Delicious:Days. 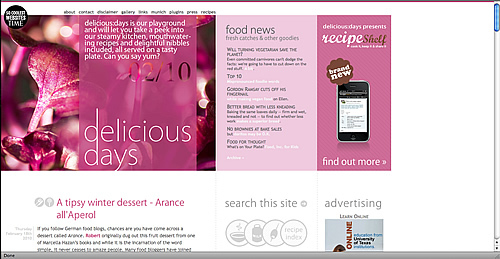 <http://www.deliciousdays.com> (27 February 2010). Té, Pim. Chez Pim. Twitter. <http://twitter.com/chezpim> (13 October 2009). Technorati. State of the Blogosphere 2008. Technorati. 22 September 2008. <http://technorati.com/blogging/state-of-the-blogosphere/> (13 October 2009). Topblogs. Essen und Trinken. Topblogs.de. <http://www.topblogs.de/category/essen-und-trinken/> (27 February 2010). Van Der Wall, Samuel. RPG Blog Carnival, May 2009: The Future Of Roleplaying. Roleplaying Pro. 1 May, 2009. <http://www.roleplayingpro.com/2009/05/01/rpg-blog-carnival-may-2009-the-future-of-roleplaying/> (12 March 2010). Blogs are a new form of expression that to those not versed in them may seem to be a perplexing use of one's time—sort of like writing in a diary and leaving it open, hoping someone will read it. To those involved with blogging, this form opens new ways of interacting with the world, of representing the self, and constructing community. Food, perhaps because of the universality of eating, is a particularly popular topic of blogs, some of which have turned into books, writing careers, and even films (for example, the award winning, Julie and Julia). McGaughey, in this essay, explores the world of food blogs, explaining how they do more than simply relate experiences about food. She argues that they bring together physical and virtual realities into a convergence culture that is unique both to and within the blogosphere. Her discussion centers on two facets of blogging: the ways in which a personal identify can be constructed and expressed through blogs and the interactions surrounding blogs as constituting communities. She also asserts that food blogs are unique as a blog genre in that they both draw from and "overflow" into real life as well as other cultural forms, such as cookbooks, films, and published memoirs. Her observations are insightful and useful. I add to them here some perspectives from folkloristics on representation of self and notions of community that may further help us understand the popularity of this phenomenon. First, blogs in general allow for representations of self that appear to be freed from the usual constraints of race, class, gender, or other external forces. The blogger can be whoever they want to be, focusing their identity on their relationship to food and their ability to write about it in an engaging way. They can disguise their personal attributes and craft an imagined persona. In a sense, this is not unique to blogs—we all do this to a certain extent in social spaces in which we are new or in public. McGaughey draws from Goffman's "front and back stages" concept here, applying them to virtual space. One feature that is distinctive to the new media is that, while the "stage" offers physical distance between bloggers and readers, it oftentimes offers ways for readers to discover more about those bloggers. Various search engines can be used to fill out their identity, finding their location, their occupational or educational background, and more personal social networking sites. Ironically, too, as a blogger develops more of their own voice, their on-line personality becomes more multi-dimensional, with off-line activities and identities referenced. An intimacy can then develop on-line that seems to cut through the usual mediators of appearance, personality style, or social skill leading to feelings of experiencing the authentic self more in on-line than face-to-face interactions. This feeling of authenticity can be powerful enough to draw individuals back to the virtual reality found in the blogosphere. McGaughey recognizes that there are different approaches to blogs. One of the points of her paper is that two bloggers she analyzes as case studies demonstrate very different expectations for how readers will respond to and use their writings. One is more informational; the other is more personable and invites interaction. Not all bloggers are seeking a virtual intimacy, but may be seeking creative outlets, or, even possible markets for their writing or ideas. The power of blogs, though, is that they allow us to speak for ourselves, not through someone else's translation of our voice. Another way of looking at blogging that I suggest is an adaption of Barbara Kirshenblatt-Gimblett's notion of "objects of memory." Like arranging souvenirs into a collage, photos in an album, or knickknacks on a shelf, blogging offers a way to select from our experiences to construct a logical narrative of our lives, to make sense of our personal histories; we are here now because of things that happened in the past. They help us recognize the significance of past events, people, places, or even objects that may have at the time seemed mundane or trivial. They also help us hold on to feelings experienced at particular times in our pasts, letting us remember things that were special. Although this may sound like an overstatement, such objects of memory offer a way to affirm the fact that we exist and that our lives might hold some meaning. This gives deep psychological reasons for why we hold onto seemingly useless or worthless items. Blogs are similar. We can look back over them to see what we were feeling in the past, to find ways that we have grown, to see how networks have developed. The second major theme McGaughey addresses is the idea of a community developing around blogging. We should perhaps ask here why the word "community" is being used—is this a "native genre" used by bloggers themselves or is it an academic construct imposed upon this group of people by the writer? Why not use sociologist George Simmel's phrase "affinity group" that describes groups that form around a single common interest and then develop into dense social relationships? In the popular imagination, the word "community" tends to be a vague concept referencing "warm and fuzzy" relationships. It can be a concrete, physical entity—a bounded, defined geographic area, such as a neighborhood—but community implies a welcoming atmosphere, a friendly neighborliness that goes beyond simply co-existence to caring for one another and a sense of mutual responsibility. Ideally, community provides the feeling that one has a place in life and matters to others, that one can expect acceptance and understanding when interacting with other members of that community. Using "community" to refer to groups of individuals, who read the same blog and respond to it, might seem to be stretching the concept, but I hear people talk about their online communities as places where they feel they can relax with friends. The fact that the virtual community is totally voluntary and can also be turned off and on according to the individual's own needs and interests makes it even more appealing than the "real" world in which the individual may have much less control. They can be part of it according to their own level of interest. This voluntariness raises questions about the accuracy of the term as a scholarly concept. Folklorists Paul Jordan-Smith and Laurel Horton, in an analysis of music and dance groups, observed that the participants themselves self-identified as part of a "community" when they felt a strong emotional connection between their own identity and the other participants (2001:103). The authors also borrow from Etienne Wenger to describe these groups as then becoming "communities of practice" (1998) with "a stable network of interpersonal relationships and a common body of semantically important resources for interpreting meaning (2001: p.105)." The last idea expressed may be particularly relevant to McCaughey's descriptions of food blogs. Perhaps, readers are drawn to them because they feel they share a way of looking at the world—food is important enough to write about, read about, and even argue about. The fact that online discussions intersect with and overflow into "real life" by individuals cooking and tasting foods included in the blog is even more affirmation of a common lens for evaluating the world outside the virtual one. McGaughey's article sheds much needed light on a phenomenon that is increasingly becoming a significant part of people's personal and social lives. She also demonstrates ways in which food blogs offer opportunities for new ways of interacting around food, ways that will perhaps become increasingly important as the world continues to become fractured yet connected through globalization. Jordan-Smith, Paul and Laurel Horton. 2001. Material Expressions of Communality Among Dance Groups," Western Folklore 60: 203-26. Kirshenblatt-Gimblett, Barbara. 1989. "Objects of Memory: Material Culture as Life Review." In Folk Groups and Folklore Genres: A Reader. Edited by Elliot Oring. Logan, UT: Utah State University Press.